Most large companies believe they have an adequate process for developing account plans and see no need to change. Revenue growth in the 4 quarters following each workshop is 54% more than expected (actual vs trend for each account, averaged across all sectors, geographies, sizes). For “troubled” accounts (-ve trend) revenue grows 80% more than expected. The benefit is greater in the first 3-6 months: first quarter improvement is typically double the above figures. For lost or “unloved” accounts (competitor is stronger) all these effects are greater: annual growth is 250%-1000%+ above trend and first quarter growth is 3-4 times more than this. The measured average ROI of these workshops is over 600x. We know of no other sales enablement or training initiative that comes close to these measured returns. However..there is usually no budget for this kind of sales development consultancy and no perceived need. Once a sales manager decides to engage us for a specific account it takes an average of 4 weeks to raise the PO, or 6-12 months if there is no budget flexibility. This delay typically represents a $0.5m – $7m opportunity cost. Workshops are generally planned 6 weeks in advance to find a date to suit all attendees and to plan, agree and execute customer interviews. Companies can and should improve their account planning process. This is their biggest revenue opportunity, with no risk and proven, immediate results. The opportunity cost of doing nothing is equivalent to 50% of current revenues. Or more. ….but inertia and corporate DNA generally conspires against this happening. To enable our clients to boost revenues on any account as and when required we work on a retainer basis with a limited number of clients. The retainer agreement guarantees our availability and familiarity and cuts lead time to a minimum. 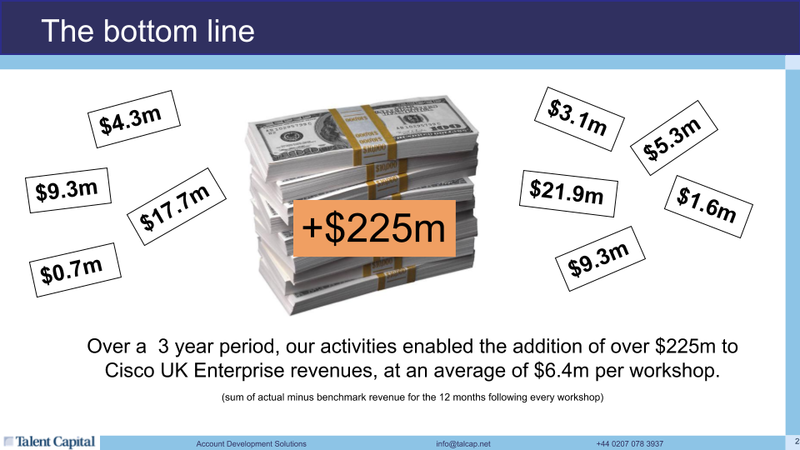 Our work with Microsoft, HP, IBM, Cisco, Dell and others has helped them add over $2bn of incremental revenue, one account at a time. We can help you make and exceed your numbers too.